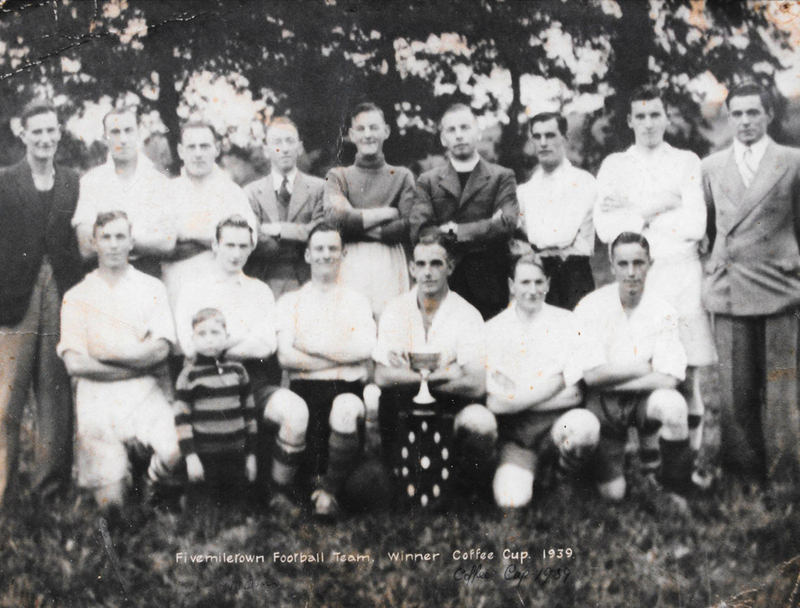 The Coffey Cup originated in 1939 when Rev Hubert Coffey decided that the pitch his family had created on the Derrylin Road on the outskirts of Lisnaskea could play host to a football tournament. So while he was studying in Dublin – at Trinity – he set the wheels in motion by purchasing a trophy and then encouraged the creation of Lisnaskea Blues. Along with Fivemiletown, Enniskillen, Lisbellaw, Lisnaskea, Clones and Maguiresbridge all entered the competition in this inaugural year. 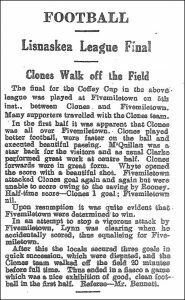 Clones pushed hard straight from the start and were rewarded with a quick goal which must have unsettled Fivemiletown as a short time later a rash tackle in front of goal resulted in Clones being awarded a penalty from which they scored, 2-0 Clones. 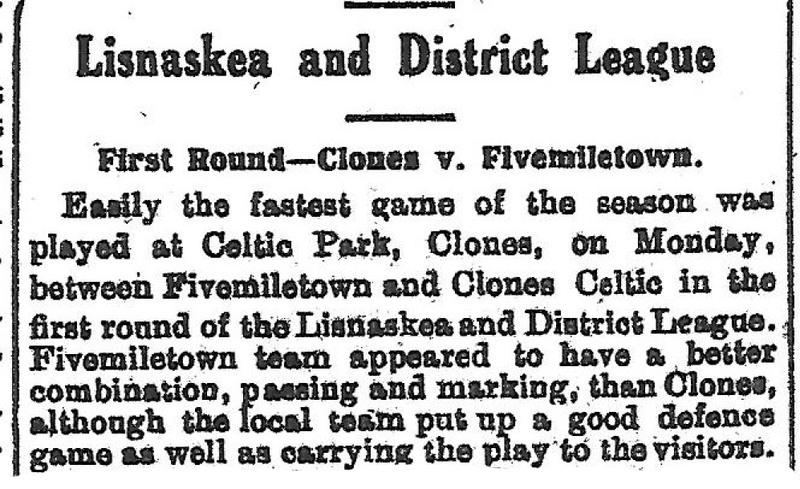 After this Fivemiletown settled down and defended well with Clones appearing ‘less careful’ with their two goal advantage, the match was a quick end to end game but it took T. Breadon to make the breakthrough for Fivemiletown, first goal for the visitors, this put ‘more heart' into Fivemiletown and a few minutes before half time Mills equalised, H/T 2-2. 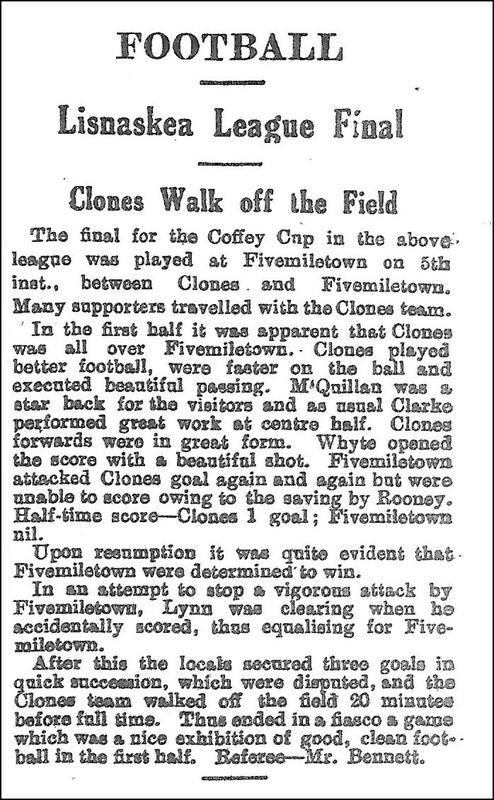 The second half picked up where it had left off, the ‘tussle went backwards and forwards’ then suddenly from a difficult angle, Clones fired in a low shot, Cullinan (Fivemiletown) attempted to block but only succeeded in putting the ball into his own net, Clones back in front. Clones were now in full swing with Fivemiletown putting up a valiant defence when again Clones were awarded a penalty and scored 4-2 Clones. Fivemiletown stormed forward putting a lot of pressure on the Clones defence but as Clones cleared, Williamson hit a beautiful long shot from the left wing into the Clones net making it 4-3. 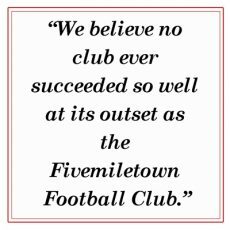 Fivemiletown had their tails up and attacked again and again, persistence paid off when McMahon succeeded in equalising. Foy, Carruth, Brown, J. Breadon, Graham, Cullinan, Williamson, Hackett, Mills, McMahon and T. Breadon. 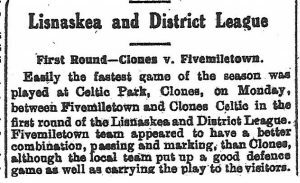 A week later Clones travelled to Maguiresbridge in the return fixture. It was reported in the Impartial Reporter that this was the ‘most unsatisfactory’ game so far and went on to say that it was played in a very ‘unsportsmanlike manner’ and was a ‘poor exhibition of football’. The game was only underway for ten minutes when the ball burst and no other ball was available, it took 30 minutes to obtain a replacement. As the second half started the game was again held up for another 15 minutes due to ‘very heavy rain’. The entire playing time took about 50 minutes instead of the usual 90. It also reported that the antagonism of the Maguiresbridge supporters towards the visiting team, the encroachment by the crowd on the Clones goal, upon these and several other grounds it is understood that Clones have lodged a protest demanding a replay of the game. If this protest went ahead I was unable to find any mention of the outcome. 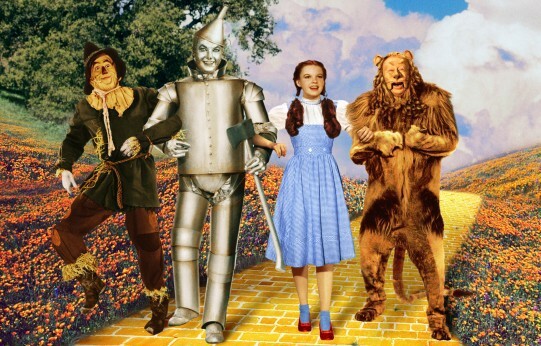 On August 15th, the much-loved classic film, The Wizard of Oz, held its Hollywood premiere.